The best meals are the ones you don’t have to go out and shop for ingredients. Or at least those are the best lunches when you’re busy working, but need to eat. Last Saturday I ended up opening up a can of Speakeasy’s Baby Daddy (which is a delicious session IPA), before realizing that maybe it was going to be one too many. Rather than pour the rest of the can out, I tossed it in the fridge and pulled it out again the next day for lunch. But instead of drinking it, I put it in a pasta sauce. I give you: IPA Chicken Fettuccine. I made this using just stuff I had kicking around the house. If you’re going all-in from scratch, then you can certainly pick up ingredients that are a little more high-quality than the ones I went with. In particular, this recipe works a ton better using heavy cream instead of half-and-half. Fresh thyme is always better than the dried stuff, and butter better than margarine. That said, this turned out absolutely fantastic using just what I had on hand, and I’m sure yours will too. The IPA gives the dish a slightly hoppy taste that changes things up from your traditional sauce in an oh-so-delicious way. I used a chicken breast I had leftover from dinner the night before. I had thrown some garlic in a bag and cooked it sous-vide (my Anova has forever changed how I cook meat and is phenomenal). Cook the chicken however you’d like. Bake it, grill it, you can even use those pre-cut chicken strips you buy at the grocery store for making salads, if you want. Once it’s cooked, cut it up into bite-sized pieces. In a medium-sized saucepan, melt your butter at a medium temp. Once it’s liquified, add your creme, garlic, and the beer to the pot and give it a stir. That stirring part is crucial to this whole process, so be sure to keep a big spoon handy to stir things often, otherwise you might end up with a pile of burned cheese at the bottom of your pan, and nobody wants that. Your first instinct is likely to dump all these cheese in your sauce at once. Don’t do it! Instead, add the equivalent of a few spoonfuls at a time, stirring the cheese into the milk as you add it, and waiting to add more until your last addition is fully melted. Going slow will ensure your cheese all melts into the sauce, and you don’t end up with that dreaded pile of burnt cheese at the bottom of the pan. Once all the cheese is in, add in the thyme as well, and turn the heat in the pan down to low. It’s almost dinner time! While your sauce is simmering, boil your pasta. If you have any extra beer left over in your can/bottle, you can put that it the water as well. The pasta will soak up the taste, and give your dish a little extra kick. While the pasta is cooking, dice up that tomato you have. Also, make sure you’re keeping an eye on that sauce, and giving it a stir every now and then. 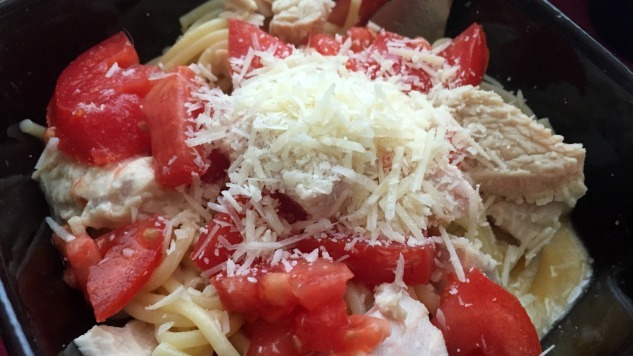 Once your pasta is done, plate the noodles, and then add the sauce, chicken, and diced tomatoes on top. I like to add those after, just to ensure everyone that’s eating gets an even share. If you’d like, you can mix everything together and serve it that way instead. I also opted to add more cheese to the top. Did it need more cheese? Let’s be honest, what doesn’t need more cheese?